SHEILA. So, I can offer you some coffee and gluten free cookies. No pancakes I'm afraid. But could you tell me what inspired the idea behind My Pancakes Taste Different Today? BRUCE: As a young father with two sons, I read a lot to my kids…I also spent most Sundays cooking pancakes with and for them--I ate quite a few myself! Trying to teach my kids life lessons, recycling and protecting the environment were also concepts that were important, but difficult to teach to young kids. I always felt that it was hard for children to grasp how their actions could impact the environment positively or negatively. The idea of My Pancakes Taste Different Today! came out of that quest. SHEILA. I can relate to that. So is Ethan based on any of your kids? BRUCE: Ethan is just like my youngest son Evan was at that age. The character of Ethan is built around Evan: Ethan is eight years old, observant, intelligent, fun loving, sweet and kind to nature, animals and others. He loves his pancakes and his mother! He is smart and funny, has tons of friends, and is always asking questions. In real life, I now have a three-year old grandson named Ethan by way of my son Matthew, so all bases are covered! SHEILA. Fun! 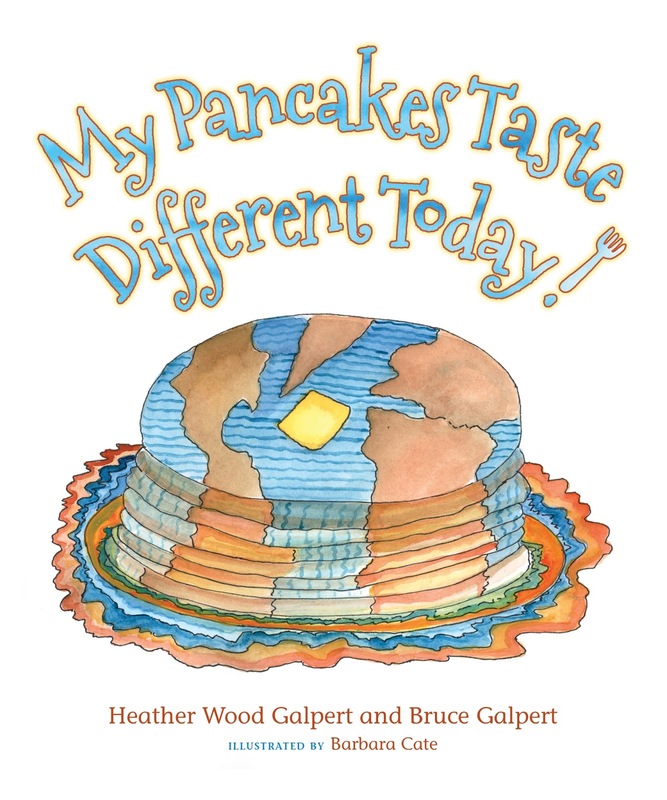 So... what was the biggest challenge you faced in writing My Pancakes Taste Different Today!? Once you'd figured out the main character, I mean. BRUCE: Getting started, the beginning, the middle, and the end! Writing is not my strong suit! Fortunately for me, my wife Heather came into my life. Not only did she inherit my family, but she inherited this project of 20 years that I was unable to complete, even after attending children’s book writing workshops given by some of the best writers in the business. She is credited for helping me put a structure around the story and move it from an idea to something I can hold and read to my grandkids. SHEILA. You sound like you make great team. What was the most rewarding moment you experienced while writing this book? BRUCE: Seeing the beautiful artwork that Barbara Cate did, and how it worked in harmony with the writing to really tell the story. Heather and I have had such a wonderful time working on this together – it’s our baby. SHEILA. How much research did you do for the book? What type of research did you do? BRUCE: Countless Sundays making all kinds of pancakes: blueberry, chocolate, apple fritters. Flipping pancakes and spending time with my boys, was the extent of my research, the best kind! And sadly, watching the growing environmental stress and crisis we are facing as the years march on. SHEILA. The pancake part sounds fun. But the environment is certainly suffering. As a European it's always seemed strange to me how long it took people to notice the problem in the US. Which, I suppose, is why you wrote the book. What does your writing process look like? BRUCE: A lot of hair pulling and the words just fall into place. Heather is the the writer in the family, I’m a numbers guy. She helped me tease out the story. SHEILA. I hope she's reading this. Where do you turn for inspiration? SHEILA. Where did your interest in writing children’s books begin? BRUCE: I have always had my favorite books…The 4 Chinese Brothers, Ferdinand the Bull, A Fly Went By, A Fish out of Water, Go Dog Go…many of these were based on cause and effect…progressive events. I am also a cartoon addict, still to this day I spend more time watching cartoons than any other medium. My son Evan is a brilliant voice over artist and my dream is to see him as a character in an animated film. SHEILA. They sound like your book would fit well in their company. Can you suggest some ways to get young people interested in the environment and what foods they eat? BRUCE: Farmer’s Markets, natural groceries, growing seeds from a packet at home. I think getting kids to engage with nature is the best way…sadly this is so hard for many kids around the world. I had the fortune to live in both Japan and the Philippines as a child and young adult, and the differences in the way each of those cultures reveres and cares for their environment is vast. It really begins culturally at a very young age. SHEILA. So how can they be taught about personal responsibility and their role in sustainability? BRUCE: By their parents, actions speak the loudest. SHEILA. 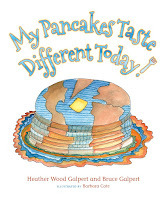 What do you hope readers take away from My Pancakes Taste Different Today!? BRUCE: I hope that parents read the book to their kids and that the book is also used as an early reader. This will be the best way to teach children how their actions impact their world. SHEILA. And what about future projects are you working on? BRUCE: We have two books in the hopper that we are both very excited about. One thing at a time I am told by my wife, but creativity has no timeline! Before going fishing one day, Ethan eats his favorite breakfast—pancakes. As his mom explains how his pancakes are made with help from the sun, clouds, rain, animals, and farmers, Ethan sees the world in a new way. While playing outside, Ethan decides to create a big splash by throwing a can in the lake and accidentally contaminates the environment. Time passes and one day Ethan notices that his pancakes taste different. Realizing his decision to make a big splash caused a problem which affected his food, Ethan enlists the help of his friends to correct his mistake. Do Ethan and his friends fix the taste of the pancakes? What do they learn in the process?